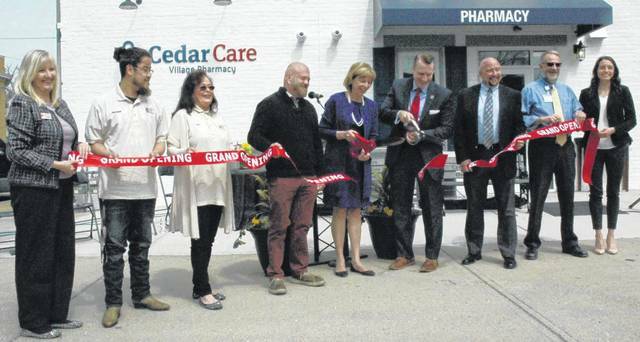 Scott Halasz | Greene County News Ohio First Lady Fran DeWine presents a proclamation to Cedar Care Village Pharmacy, which held a ribbon cutting Thursday. Representatives from the Village of Cedarville, Cedarville University, along with Ohio First Lady Fran DeWine, cut the ribbon to open Cedar Care Village Pharmacy. CEDARVILLE — After an intensive renovation and multiple rounds of finishing touches, Cedarville’s newest pharmacy opened Thursday. Community and Cedarville University leaders along with Ohio First Lady Fran DeWine joined to cut the ribbon on Cedar Care Village Pharmacy where the former Cedarville Hardware Store once was. The pharmacy will serve the village of Cedarville as well as students, faculty, and staff at Cedarville University. The location of the “teaching pharmacy” will be a clinical rotation site starting spring semester 2019 for pharmacy students. The former Cedarville Hardware Store, located at the intersection of S.R. 42 and Main Street in Cedarville, was purchased in early 2018 by Cedar Care, L.L.C., following the unexpected death of the hardware store’s owner, Glenn Fawcett. The renovation began in earnest last fall and finished in January. In addition to a proclamation read by DeWine, CU President Dr. Thomas White presented a pair of benches dedicated to Fawcett and the Luttenberger family, owners of the hardware store from 1952-1999 before Fawcett purchased it. Cedar Care will be a full-service pharmacy offering: full prescription service; prescription refills and transfers; free delivery within Cedarville; curbside service; flu shots; medication adherence programs; medical equipment and devices; medication therapy management; multi-dose pill packaging; prescription compounding; personal consultations; email and text message refill reminders; dietary supplements and vitamin consults; and student-athlete care programs. 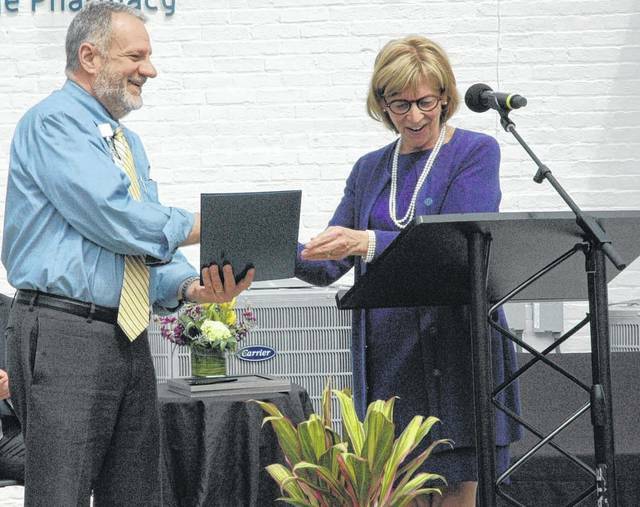 https://www.xeniagazette.com/wp-content/uploads/sites/32/2019/04/web1_DSC_6686.jpgScott Halasz | Greene County News Ohio First Lady Fran DeWine presents a proclamation to Cedar Care Village Pharmacy, which held a ribbon cutting Thursday. https://www.xeniagazette.com/wp-content/uploads/sites/32/2019/04/web1_DSC_6691.jpgRepresentatives from the Village of Cedarville, Cedarville University, along with Ohio First Lady Fran DeWine, cut the ribbon to open Cedar Care Village Pharmacy.